If a person is in the United States without legal status, whether they came without obtaining sufficient legal permission, lost legal status when their visa expired or their circumstances changed, or committed a crime while in the United States, that person faces the possibility of removal, also called deportation. For those in this situation, there may be no greater fear. If deported, they face the prospect of losing the life they have built in the Houston area, and possibly being separated from family. They may be sent back to a country with fewer economic prospects, where they know few people, or, worse, that is dangerous. They may not even know the language of their home country. If you, a loved one or your employee faces the possibility of deportation, having an experienced Houston removal lawyer on your side could make the difference in the outcome of the proceedings. 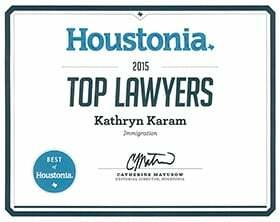 Kathryn Karam is a skilled immigration attorney who assists those facing removal proceedings. Deportation is one of the most frightening situations that may arise. Kathryn Karam is experienced in developing creative solutions to difficult problems. She will search for the best possible removal defense for you, your loved one or your valued employee. Call Karam Immigration Law today at (832) 582-0620 to set up a consultation. Karam Immigration Law assists with those facing removal proceedings in the immigration court in Houston, which could include anyone in the region, including Sugar Land, The Woodlands, Cypress, Tomball or Cinco Ranch. There are many ways to inadvertently fall under one or more of these grounds. For instance, if you accidentally check a box saying you are a United States citizen on a job application, you could be put in removal proceedings. Adjustment of Status (AOS): If a person is eligible to become a lawful permanent resident, that person may seek to adjust his or her status to become a permanent resident. Cancellation of Removal (42a or 42b): To be eligible to have a removal proceeding cancelled, a person must meet certain conditions. If a permanent resident, the person must have lived in the United States for seven years, been a permanent resident for five years, never been convicted of an aggravated felony, not be a terrorist and have never been granted a cancellation of removal before. If not a permanent resident, the person must have lived continuously in the United States for the previous 10 years, be of "good moral character," have a record free of certain criminal convictions, and the removal must create extreme or unusual hardship on a U.S. citizen or permanent resident who is the person's spouse, child or parent. Crime Victims: People who are victims of crimes may be eligible for a visa or cancellation of removal. Certain victims of domestic violence qualify for a cancellation under the Violence Against Women Act (VAWA). Other crime victims may qualify for a U-Visa. Special Immigrant Juvenile Status (SIJ) and Deferred Action for Childhood Arrivals (DACA): A juvenile who has been abandoned or abused may be eligible to apply for Adjustment of Status based on a Special Immigrant Juvenile petition. Young people who meet the requirements for Deferred Action for Childhood Arrivals (DACA) may seek to apply for DACA and potentially terminate their removal proceedings. Voluntary Departure: A removable person is given four months, and then must return to his or her home country. Voluntary departure may be the only option for some people who are removable but want to return to the United States.